Fireworks typically rule the skies on New Year’s Day but within the first few seconds of 2016 in South Bend, gun shots were fired into the night sky hundreds of times. For the last several years, celebratory gun fire in South Bend has become a tradition when the clock strikes midnight on New Year’s Day. “Yeah it’s been going on ever since I started in the police department in ’78 and there’s never been a real plan within the police department to go out and do something,” said Derek Dieter, former South Bend council member and officer. This year the South Bend Common Council amended an ordinance that set a fine at $2500 for shooting a gun irresponsibly that went into effect on December 25. 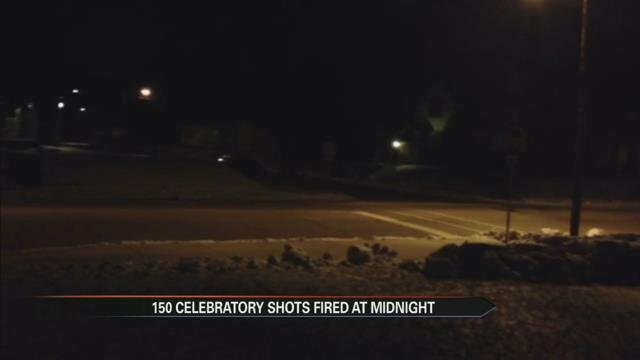 But even still, to ring in the new year, people in South Bend fired hundreds of celebratory gun shots into the air. Some, just a block away from where ABC 57 was stationed in a vehicle with Dieter on the corner of Wilber and Vassar streets. Within the first 7 minutes of 2016 in South Bend, Dieter counted at least 150 shots fired. Gun fire from revolvers, semi-automatics, and shotguns were all heard by the former cop. “I think it happens in South Bend more than in other communities around here, especially on this side of town. If you want to dissect why it happens, that’ll be a whole different story to find out why but it’s something that is bad for South Bend,” said Dieter. The gun shots finally started to fade away just before 12:20 on Friday morning, but Dieter said people would be firing their weapons for the next several hours at a slower rate. South Bend Police tell ABC 57 News, no arrests have been made and no citations were handed out for the celebratory gun fire but that could change after investigations are made into the incidents over the next several days. South Bend Police also say there were 30 ShotSpotter alerts on Friday morning. For some folks, the first few minutes of 2016 were loud ones. Residents on South Bend's Northwest side say they rang in the New Year with the sound of gunfire. This comes just after the city passed a new law to curb this kind of behavior. Just over two weeks ago, the South Bend Common Council raised the fine for celebratory gunfire to $2,500. The police chief hoped it would make folks think twice before firing a round into the sky. But folks on the city's Northwest side say if last night served as a test, the fine flat-out failed. Forty-year South Bend Police veteran and former councilman Derek Dieter spent the first few minutes of the new year capturing the sounds of gunshots on the corner of Wilber Street and Vassar Ave in South Bend. "Probably six to eight minutes of literally probably 150 or so shots," said Dieter. He says he heard shotguns, rifles, semi-automatics and even some automatic guns - some too close for comfort. "When we went down Vassar you could hear whizzing by shwooh!" said Dieter. "It's almost like a whistling sound." South Bend Police say they received 35 calls before midnight of shots fired. And early reports from ShotSpotter indicate 183 shots on the city's Northwest side alone. "It sounded like a war zone out here," said resident Debbie Sallee. Despite the council's move to raise the celebratory gunfire fine, residents say they won't be surprised to find gun shells on the ground again this year. "They do what they pretty much want around here," said resident Wayne O'Connor. They say the fine may look tough on paper, but in reality, it'll take more than a steep ticket to stop folks from pulling the trigger. "When the police actually arrest these idiots," said Sallee. "Then they need to keep them locked up." As of now, police have not confirmed any tickets issued on New Year's Eve night for any shots fired. Dieter says there's never one solution, but his main problem with the gunfire law was its focus on celebratory gunfire. He says the fines should be enforced year round, not just on New Year's Eve and the Fourth of July. Another useless ordinance that won't be enforced ! Bingo wrote: Another useless ordinance that won't be enforced ! 90% of the visolators can't afford the fine and the rest won't pay iy.. It would be better to educate the public in finding the safest spot in their home. A total of four young women were taken to the hospital Sunday morning after a shooting in South Bend. South Bend Police say it happened around 12:30 a.m.
Police say a car carrying a male driver and four juvenile females was driving north on Harrison. That's when another car pulled up from behind and someone inside that vehicle started shooting with a rifle. The victims' car then crashed into a parked truck at California. All of the women were taken to the hospital. Two sustained gunshot wounds. The other two were hurt in the crash. Police say the driver of the car carrying the victims fled the scene. At this point, no one has been arrested. Police describe the suspect's car as a dark-colored SUV. If you have any information you're asked to call South Bend police. SOUTH BEND — The two teenage girls who were shot early Sunday were released from the hospital later that day, according to police. The shooting occurred about 12:40 a.m. Sunday near the intersection of Harrison and Van Buren streets, in South Bend, police say. The victims, who were ages 12 and 13, were riding in a vehicle traveling north on Harrison when they were struck by bullets fired by a person in a vehicle that pulled up from behind. Capt. Robert Hammer, police department spokesman, said the incident is still under investigation. Posted: Tuesday, January 5, 2016 6:00 am | Updated: 6:57 am, Tue Jan 5, 2016. A GPS tracking device allowed St. Joseph County police to spend three weeks keeping tabs on an alleged "pillowcase burglar" who is suspected of targeting dozens of homes in a months-long crime spree before his arrest Saturday. Darrell Vaughn, 50, was arrested after a break-in Saturday morning in Elkhart County and was being held there on suspicion of burglary, illegal possession of a firearm by a felon, possession of stolen property and theft. St. Joseph County police say evidence discovered during a search of Vaughn's Elkhart home linked him to a series of connected burglaries that first drew attention in South Bend nearly three years ago, in the spring of 2013. Since then, at least one burglar has struck dozens of homes in South Bend, Granger, suburban St. Joseph County and the Elkhart area. The burglaries stood out because of a consistent method of operation. In most cases, the burglar entered through a window, often during the day, and took small valuables, bagging them in a pillowcase. He ignored large items and those that could be traced using serial numbers, such as electronics and firearms. The arrest Saturday came after about three weeks of surveillance that started when police obtained a warrant to place a tracking device on Vaughn's car, said St. Joseph County police Assistant Chief Bill Thompson. Investigators who were aware of Vaughn began to suspect him in connection with the burglaries several months ago after their research revealed elements of his background that raised suspicion, Thompson said. "It really is, in this particular case, kind of a cool nexus between some interesting technology and good, old-fashioned police work," he said. A St. Joseph County judge initially denied a request for a warrant to place the GPS tracker because of concerns about the supporting evidence, but detectives gathered more information and eventually got the warrant. Vaughn was arrested shortly after his latest alleged burglary in Elkhart County. When police served a search warrant at his home in the 300 block of Martin Street in Elkhart, they found valuables, such as jewelry and watches, that were consistent with property stolen during the rash of burglaries, Thompson said. Vaughn had not been formally charged in Elkhart or St. Joseph counties Monday, though charges were expected as early as Tuesday in Elkhart County, said Chief Deputy Prosecutor Vicki Becker. St. Joseph County prosecutors were awaiting more information from police and expected to begin reviewing the case by the end of the week, a spokeswoman said. Many questions had yet to be answered Monday. For example, Thompson said, police had more work ahead of them to determine how many of the burglaries could be attributed to Vaughn, noting that the exact number may remain a mystery. "It's difficult to pin down a hard number, but we're pretty comfortable in our belief that this particular violator was quite active and had been for some time," Thompson said, adding that investigators also would need to find out whether Vaughn was working alone or as part of a team. Posted: Sunday, January 3, 2016 6:00 am | Updated: 11:18 am, Sun Jan 3, 2016. BRICK, N.J. (AP) — An Indiana man has been arrested in Ocean County for allegedly possessing an arsenal of weapons as he stalked an online girlfriend. Police in Brick Township say they found Antonio Perez sleeping in his car at a baseball complex early Wednesday. A search revealed the 24-year-old Elkhart, Indiana resident had a .40-caliber handgun, .38-caliber revolver, .357 revolver and an AK-47-style rifle, all loaded. He also allegedly had 1,000 rounds of ammunition, pepper spray and a mask. Police allege Perez was on his way to meet a girlfriend he'd met on Facebook but had never met in person. The woman was located by police and was unharmed. Perez was charged with crimes including stalking and numerous weapons offenses. It couldn't immediately be determined if Perez had retained a lawyer. Posted: Saturday, January 9, 2016 11:36 am | Updated: 5:27 am, Sun Jan 10, 2016. NORTH LIBERTY — Police said a man died Saturday morning after he shot himself in an possible accident at a rural property near North Liberty. Police and medics responded shortly after 10 a.m. to a home in the 67100 block of Sage Road, where they found the 88-year-old man unresponsive with a gunshot wound. Radio traffic indicated the man had a wound to the chest, but a police spokesman said he could not confirm that information. Police have not named the man. St. Joseph County police Assistant Chief Bill Thompson said evidence suggested the shooting was an accident, though authorities would not make an official ruling until after an examination by a deputy coroner planned for Sunday. According to Thompson, police learned the man had told a family member he was going to a barn to shoot a groundhog. Family members found the man some time later when they went to check on him. The man was using a .22-caliber rifle, Thompson said.